As winter days are fading away and warmer days are coming closer, we all are about to enjoy few parties that are followed by great music and great fun. This is the reason we have chosen a music concept and here with we present you the Musicbox. Musicbox is fully responsive Joomla template and comes with 5 pre-defined color styles followed by the built in color switcher that will help you create unlimited color combos. Stunning typography, parallax backgrounds and image hover effects will keep your visitors glued to your site. Over 55 built in module positions are there to help you customize this template the way you like it and each of these can use 4 custom module styles to present your module content. Musicbox template also contains custom built in styles for K2 Component, YJ Ajax Contact, YJ News Pop, YJ Media Slider,YJ Countdown and YJ Engine modules. For greater flexibility we have added additional options that can help you customize your Musicbox. Those entail, full or boxed site layout switch, sticky menu with specific page assignment, hover effects switch , scroll reveal switch and grid backgrounds selector. 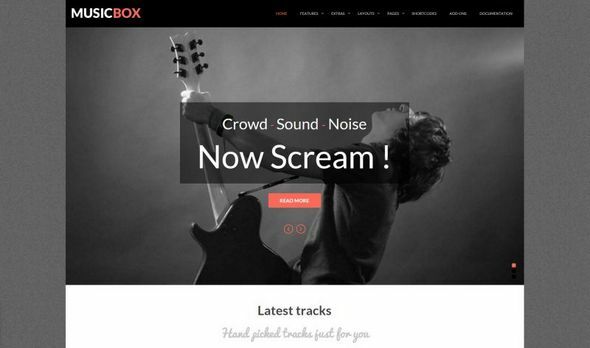 So be fast, download Musicbox now and make the world hear the sound of your website.